Seaside Grand Hotel Residencia is set on the golden sands of the beach and is ideal for couples wanting to enjoy excellent amenities and entertainment, as well as plenty of opportunities to relax. Each of the rooms enjoys elegant interiors with classic details and a private terrace where you can relax with a drink and overlook the extensive gardens of the hotel. Spend your days relaxing in the spa or by one of the two swimming pools, or try activities including exclusive access to the island’s golf courses, a bridge club, yoga, tai chi, and much more. Gran Canaria is well known for its professional standard golf courses which offer spectacular views. Specially modified rooms for people with reduced mobility are available on request. This hotel is not recommended for children, however it is not an adult-only property. The hotel’s main restaurant is decorated in bright, luxurious style and offers a range of gourmet dishes. Dine inside or on the al fresco terrace and enjoy Mediterranean and international menus designed by expert chefs. Half board and bed and breakfast guests can enjoy meals in the restaurant. An evening jacket and long trousers are required for evening meals. 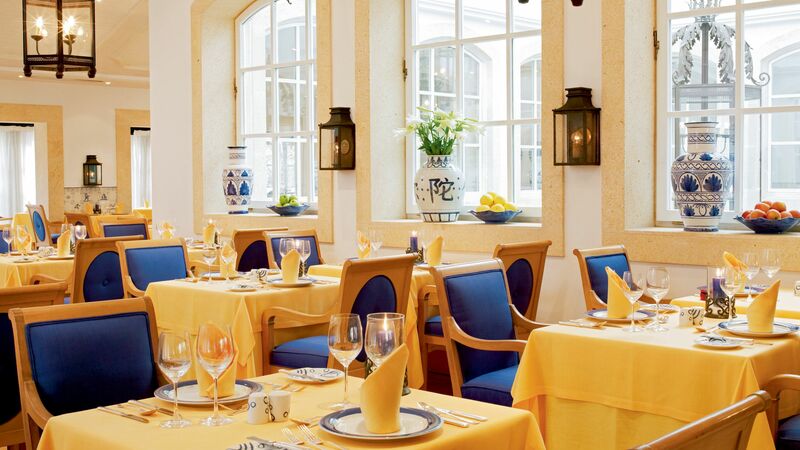 This elegant restaurant offers colonial inspired interiors and a bright al fresco terrace. Choose from aperitifs, cocktails, fine wines and champagnes as you listen to the live piano music or lounge music. Beachy interiors and a sunny terrace provide the perfect place to enjoy light bites and snacks, seaside waffles and other unique options. Wander along the golden sands of Maspalomas beach which stretches out in front of the Seaside Grand Hotel Residencia. There are two heated outdoor swimming pools to choose from. Both are saltwater and one of the pools is for spa guests. Although we don’t recommend this hotel for children, there is a kids’ club where little ones can enjoy activities and games from morning till night, with expert staff on hand to ensure even the most active are kept entertained. There is a playground, children’s paddling pool and a playroom where they can watch movies and play video games. 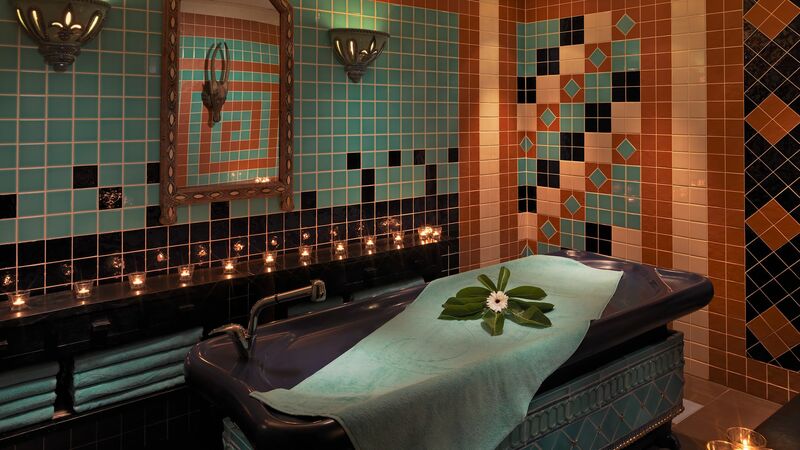 The hotel’s spa offers a range of luxury treatments which are offered in the bright and beautiful interiors. Choose from an extensive menu of options, or enjoy the sauna, steam bath, plunge pool, ice fountains and more. The spa welcomes guests aged 16 years and above. The fitness terrace has a range of cardio and strength equipment, as well as offering personal training sessions and pretty views. There are also aqua gym classes, and a professional physiotherapy centre. A range of activities is offered for both children and adults throughout the day. Play giant chess on the lawns, learn to scuba dive, enjoy table tennis tournaments or hiking and cycling. Reduced green fees are available for guests of the Seaside Grand Hotel Residencia at selected professional standard clubs throughout Fuerteventura. The ancient art of tai chi is the perfect way to quiet the mind and keep your body strong and fit. Learn coordination and proper breathing techniques from expert instructors. The hotel’s bridge salon allows guests to learn to play, as well as find new people to play with. It’s perfect for both beginners and experts. The hotel’s turf course is floodlit at night and allows guests to play throughout the day. There is also equipment available to borrow from the hotel. Join expert instructors as they lead you through a variety of poses and relaxing yoga flows in the hotel’s gardens or spa. Meditation sessions are also available. 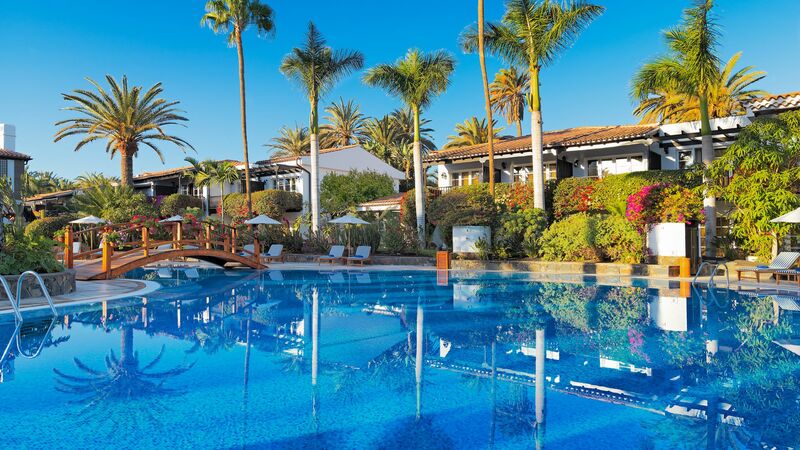 Seaside Grand Hotel Residencia is found on the south coast of Gran Canaria, in beautiful Maspalomas. Activities in the resort centre around its beautiful natural surroundings, with the sparkling Atlantic, golden sands of the beach and desert like sand dunes within easy reach. Spend the day simply relaxing on the beach before watching the sun set behind the famous lighthouse. There are bars and restaurants scattered near the beach, as well as little boutiques and larger shopping centres in the centre of town. Golf lovers are just a five minute drive from Maspalomas Golf, while those wanting to immerse themselves in natural surroundings can take a guided tour of the dunes. These huge dunes will make you feel as if you’re in the desert, with the secluded beach close by. 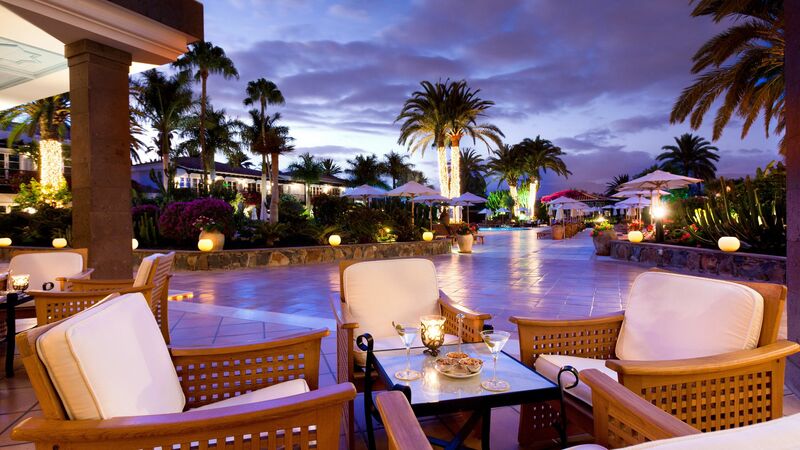 Seaside Grand Hotel Residencia is a 25 minute drive from Gran Canaria Airport. Twin Rooms are decorated and feature furnishings in a Spanish-colonial style with a touch of luxury. The bathroom offers a walk-in bathtub with hydromassage and the private balcony or terrace has views over the gardens or side views of the dunes. Water, fresh fruit and a newspaper is delivered to the room daily. Twin Pool View rooms are decorated and feature furnishings in a Spanish-colonial style with a touch of luxury. The bathroom offers a walk-in bathtub with hydromassage and the private balcony or terrace has views over the pool which is lit up in the evening. Water, fresh fruit and a newspaper is delivered to the room daily. Junior Suites are spacious in size and offer a generous living area. They are located in two story villas and from the balcony or terrace there are views of the pool, gardens or side dune views. The bathroom features a bathtub with hydromassage jets and a separate shower. Guests will receive daily replenishments of water, fresh fruit and a newspaper. Guests staying between 01 July - 06 September 2019 will receive one Diamond Rose 80 minute luxury body treatment and one 25 minute back massage per room booked by 28 February 2019. Sovereign guests will receive a bottle of pink Cava in their room on arrival for holidays until 31 October 2019. Special 'Honeymoon Package" featuring one bottle of cava and strawberries on arrival, one Honeydreams for 2 people in the SPA Centre, VIP amenities during the stay and one room service continental breakfast for holidays until 31 October 2019. Bookings must be identified as "Honeymoon" and customers are requested to present a copy of their wedding certificate upon arrival at the hotel reception. This offer is valid for up to 6 months after the wedding has taken place. This was our second stay and the service levels were as exemplary as we had remembered. The staff are consistently helpful and friendly. Nothing is too much trouble and the little touches (such as flowers and a cake in our room on my wife's birthday) were much appreciated. The food was excellent (even if a couple of the more creative dinner dishes didn't quite hit the mark). 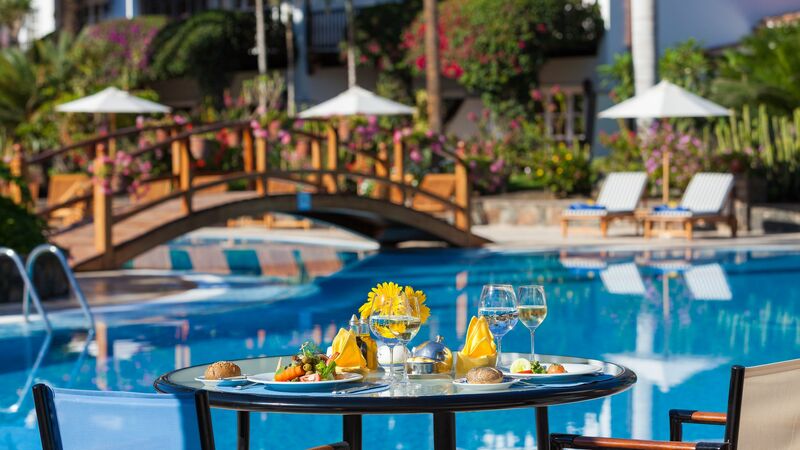 I would particularly commend the Sunday barbeque (the pasta dipped in a huge chunk of parmesan and grilled local fish being highlights) and the poolside lunch (extensive menu, delicious specials - eg grilled prawns and avocado tartar - tempting desserts and attentive service). The clientele are generally a bit older but our two teenage kids (one of whom was revising for A-levels and the other was happy reading and swimming in the nicely heated pool) really enjoyed their week break in the sun. We could not fault this hotel in any way. It?? ?s staff anticipated our every need. My wife injured her knee just before we were due to arrive. No problem, our room was changed to one with easy access even though the hotel was full. Food was excellent. We never go half board, but on this occasion we were seduced into doing so by a special offer on arrival and did not regret it. Initially we were surprised at the number of people who have holidayed here year after year. Now we know why and have already booked for next year. However, this is not a family hotel. There are no facilities for children. A better choice for families would be the sister hotel across the road. Demographically, the guests were almost all 60+, so don?? ?t expect any late night raving. “ An oasis of peace, quality food and first class service. We don't normally revisit hotels - this is the exception. Service is of the highest quality - responsive, attentive to key details, friendly - and unpretentious.Fresh food imaginatively prepared and presented. Well appointed and good sized rooms. Our first visit was both surprising and overwhelming We were impressed by the rooms, attentive staff, and the food was beyond a Top London restaurant. The location, was very accessible to everything , retail upmarket shops, good Beach, taxis and bus station, cafes and restaurants. Although, we had to force Ourselves to leave the hotel, as you had everything you needed at hand. If you haven?? ?t been to this little heavenly gem, and you like nice things, I suggest you look no further than to book this hotel and get a little bit of heaven, Albeit for one week. Enjoy, as we did, so we have booked again before we left!!!! !